Anniversary of 9/11 – We Should Never Forget! This date, 9-11, carries a heavy burden of memory. This day does not pass in the calendar without our remembering. We remember images of death and destruction. Images that human eyes were never meant to see. We remember words our ears were never meant to hear, the tender last words of husbands and wives who would never embrace again. We imagine the feeling of emptiness in the arms of children who at the end of the day could not find mom or dad for their welcome home hug. We remember our own feelings of emptiness as our sense of security, as our own confidence in the predictable order of life and work was radically shaken. 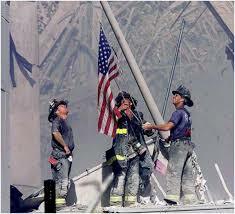 We remember the heroism of the many that lost their lives in saving others. We remember all those who suffered and died, we grieve for them still, friends and strangers alike, along with their families and friends. And it is right that it should not pass from our memory. But today and in this prayer, along with our remembrance of profound loss, it also seems right that we give voice to our deep longing for peace, and with this prayer, commit ourselves to those actions that will draw us closer to our most ancient and most holy desire, peace among all God’s children. Lord, grant us peace. Amen.